Seamless expression of comfortable sophistication in this stunning Craftsman-style home located in desirable Arbor Lake in Edwardsville. Cozy and warm yet expansive in design this 4 bdrm, 4 bth home features 11 ft ceilings w/ wood beams in the great rm w/a stone front gas frplc w/ built-in bookshelves on each side. Many upgrades including hrdwd flrs, tile flooring in all bths & laundry rm, granite surfaces in the kitchen/baths/laundry/bar, oversized millwork, recessed lighting, walk-in closets in all bdrms, irrigation system, central vac, water softener, custom interior shutters, transom windows, & built-in drop zone. 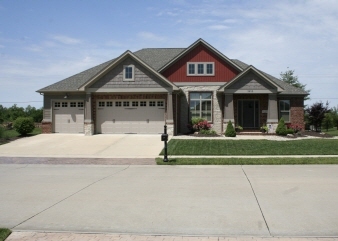 Gorgeous kitchen w/ large center island, walk-in pantry, designer pendant lights, SS appliances, & a large dining area. Finished LL w/ family rm, rec area, dry bar, full bth, bdrm, & loads of storage space or room to expand. Luxury master bdrm w/ tray ceiling, hrdwd flrs, & an incredible master bath! New roof June 2017. Common ground lake access.